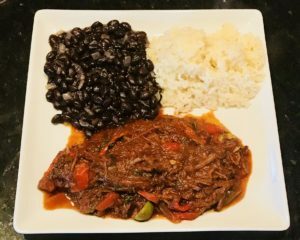 Ropa Vieja: Cuba Here I Come! 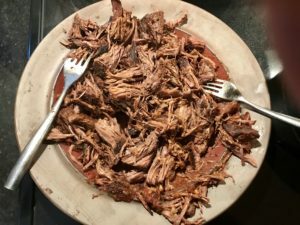 The Daring Gourmet recommends using chuck instead of the usual flank, as chuck has more flavor and is better suited than flank to a long braise. The Daring Gourmet also recommended asking your butcher to cut a chuck roast that was longer than wide, with the long side going with the grain of the meat, such that when you shred it after a long braise, you end up with long strands. I took this advice, and lucky for me, Mike was working at Walt’s Market yesterday. He used to have his own butcher shop, and now works part time at Walt’s. He is about my age, so has been cutting meat for a long time. I showed Mike the picture of what I wanted from the Daring Gourmet site and he knew exactly what to do. I told him I needed to end up with a 2 pound roast. He then takes a larger chunk of chuck and carves out a piece just like in the picture, and plops it on the scale. 2.0 pounds exactly! Friggin’ awesome. I didn’t take pictures of all of the process steps because you can see those in over-the-top detail on the Daring Gourmet. 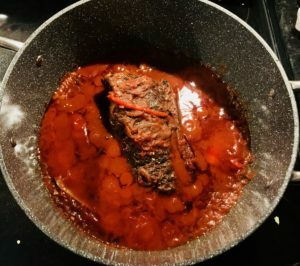 You first brown the 2 pound chuck roast in a Dutch Oven in 1 T of sunflower oil. This was the maiden voyage of my new Vesuvio Dutch Oven from DaTerra Cucina, which makes ceramic-coated, nonstick cookware that is PTFE/PFOA-free. It was just as awesome as my Vesuvio skillet and sauté pan. Can’t recommend these pans highly enough. They cook and clean up better than any of my other pans. I now do not cook with anything else, except occasionally a cast iron skillet when I want a really, really hot sear. The Vesuvio Dutch Oven worked fine for browning the chuck roast today, as well as for the long stovetop braise. It can also go in the oven (up to 450F). 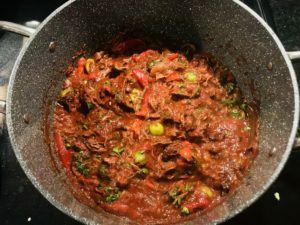 Once the chuck roast is nicely browned on all sides, you remove it from the pan to a plate, then turn down the heat to medium and sauté till caramelized: 1 thinly sliced yellow onion, 1 thinly sliced green bell pepper, 1 thinly sliced red bell pepper and 1 thinly sliced yellow bell pepper. Caramelizing the veggies takes about 15 minutes. 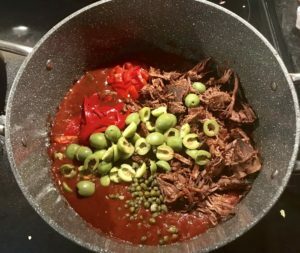 You then add the meat back to the sauce along with 1 cup sliced green olives, ½ cup thinly-sliced, drained roasted red peppers, ½ cup rinsed and drained pimento and ¼ cup rinsed and drained capers. And again as plated, with white rice and black beans. Then you turn it once with a fork from bottom to top, cover, cook on low heat for 10 min, turn again once from bottom to top, cover, and cook on low heat for another 10 min. 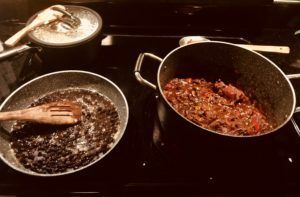 While the rice and Ropa Vieja were simmering, I jazzed up a can of black beans by sautéing ½ chopped yellow onion in 1 T of bacon fat till soft (about 10 minutes), then adding 2 T of Goya Recaito Culantro Cooking Base and a 15.5 oz can of Goya black beans with their liquid, and simmered till the Ropa Vieja and the rice were done. *In the past, I have used kosher salt for cooking and sea salt for salads and other cold dishes. My daughter Liz has convinced me to use sea salt for cooking as well, as she claims that kosher salt is bleached. It looks interesting. I’ll try some in Cuba but I’ll bet yours is better! Gracias Kip, parece muy rico y sabroso! Si, mi gusta mucho este plato. 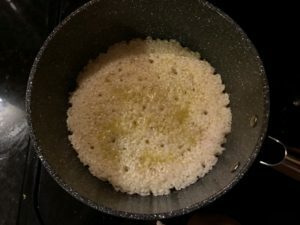 Va muy bien con los frijoles y arroz.